* This puppy has been adopted. A bulldog is the common name for a breed of dog also referred to as the English bulldog or British Bulldog. 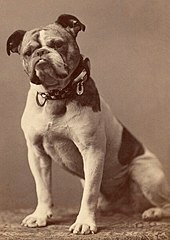 Other bulldog breeds include the American bulldog and the French bulldog. The bulldog is a muscular heavy dog with a wrinkled face and a distinctive pushed-in nose. The American Kennel Club (AKC), The Kennel Club (UK) and the United Kennel Club (UKC) oversee breeding standards. The bulldog is a breed with characteristically thick shoulders and a matching head. There are generally thick folds of skin on a bulldog's brow, followed by round, black, wide-set eyes, a short muzzle with characteristic folds called "rope" above the nose, with hanging skin under the neck, drooping lips, and pointed teeth. 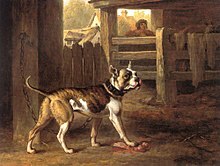 The coat is short, flat and sleek, with colors of red, fawn, white, brindle (mixed colors, often in waves or irregular stripes), and piebalds of these. In the US, the size of a typical mature male is about 45 pounds and that for mature females is about 45 pounds for a Standard English Bulldog. In the United Kingdom, the breed standard is 55 pounds for a male and 50 pounds for a female. While some canine breeds have their tails cut or docked soon after birth, bulldogs are one of very few breeds whose tail is naturally short and curled. Despite their famous "sourpuss" expression, bulldogs are generally docile and easy to please. They can move quickly over short distances. Bulldogs do not need a lot of physical exercise, so they are well-suited for living in apartments and other urban environments. They are friendly and gregarious but occasionally willful. The phrase "stubborn as a bulldog" is loosely rooted in fact. They rank 78th out of 80 in Stanley Coren's The Intelligence of Dogs, being of lowest degree working/obedience intelligence. Breeders have worked to breed aggression out of the breed, and as such, the dog is known to be of generally good temperament. Due to their friendly, patient nature, bulldogs are known for getting along well with children, other dogs, and pets. Bulldogs can be so attached to home and family that they will not venture out of the yard without a human companion. Bulldog breed clubs put the average life span of the breed at 8–12 years, although a UK survey puts it at 6.5 years. The leading cause of death of Bulldogs in the survey was cardiac related (20%), cancer (18%) and old age (9%). Those that died of old age had an average life span of 10 to 11 years. Statistics from the Orthopedic Foundation for Animals indicate that of the 467 Bulldogs tested between 1979 and 2009 (36 years), 73.9% were affected by hip dysplasia, the highest amongst all breeds. Similarly, the breed has the worst score in the British Veterinary Association/Kennel Club Hip Dysplasia scoring scheme, although only 22 Bulldogs were tested in the Scheme. Patellar luxation is another condition which affects 6.2% of Bulldogs . Some individuals of this breed are prone to interdigital cysts, which are cysts that form between the toes. These cause the dog some discomfort, but are treatable either by vet or an experienced owner. They may also suffer from respiratory problems. Other problems can include cherry eye, a protrusion of the inner eyelid (which can be corrected by a veterinarian), certain allergies, and hip issues in older bulldogs. Puppies are frequently delivered by Caesarean section because their characteristically large heads can become lodged in the mother's birth canal during natural birth. However, it is not entirely uncommon for a bulldog to whelp naturally and successfully. Over 80% of Bulldog litters are delivered by Caesarean section. ..